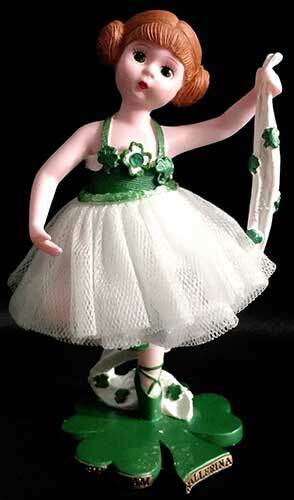 Irish Dream Ballerina is the name of this doll that is enhanced with shamrocks. This Irish doll is for decorative use only. It is not for young children. 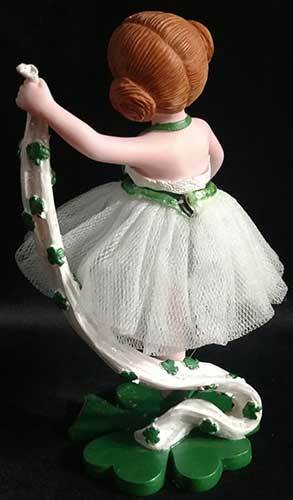 This Irish figurine is a ballerina that features shamrocks on her dress along with a shamrock enhanced white scarf. The Irish doll is further enhanced with a white tutu along with a shamrock shaped pedestal. The porcelain figurine measures 5 1/2" tall. The Irish Dream Ballerina is made by Madame Alexander; she is gift boxed with a shamrock history card, complements of The Irish Gift House.